Euro Breaking Higher – But Why? Many have noticed the momentous break to the upside that’s been staged by the Euro today – many with the assumption that this is on the back of the Greek Austerity measure that was passed. While parliament was meeting in Greece during the vote, riots were heating up throughout the streets of Athens. Riots…. In general…. Are not good things for economies. This has left many traders scratching their heads as to ‘Why,’ the Euro has made this move. And that’s a good question. Not only is Greece a concern for the Euro, but at the same time – Ireland is facing 14%+ inflation, Spain is seeing much public debate over their proposed austerity measures (which if not passed can pose a threat far larger than Greece on the Euro Zone). Suffice to say, there isn’t a whole lot of great news coming out of Europe – yet the currency has continued to climb? This is a great example of the driver behind currency prices. While all of this was going on – traders kept in mind the comments of ECB head Jean-Claude Trichet – in which he reiterated the vantage point that ECB decision makers were using ‘strong vigilance,’ regarding inflation. The fact that these comments, combined with this price action – is taking place a little over a week before the next ECB meeting points to the fact that traders and investors are looking for an interest rate hike. If rates do get raised, economies such as Ireland and Spain may face further difficulties. Ireland is currently struggling with the 14%+ inflation that was mentioned above. They are also receiving assistance from the ECB, and Ireland is a situation that would generally dictate LOWER rates, not HIGHER – further exacerbating the difficulties their economy is having getting their feet underneath itself. Across the continent in Spain, Austerity measures seem to be much less-well received than hoped, bringing the fear that Spain may be looking at its own default in the not-too-distant future. What does this mean to me as a Trader? Well – these are the types of situations that can be ideal for longer-term strategies and traders. While I have a feeling of bearishness on the Euro, the chart is showing me something different. On top of that – I can understand this move. The market, while fearful of the potential of a default out of Ireland, Spain, and perhaps even Portugal – is pricing Euro higher on the basis of an interest rate hike. So, I’m looking for continued gains – at least in the shorter-term – on EUR/USD up to and perhaps even through the ECB announcement next week (depending on the Trichet verbiage around the announcement). However, I want to stay fully cognizant of the fault lines that could cause a crack in the currency; Mainly Irish and Spanish solvency (Including the Spanish Austerity measures). Near-term resistance: 1.47, at this price I’m going to look to close off any long positions in euro that I may have open at the time. 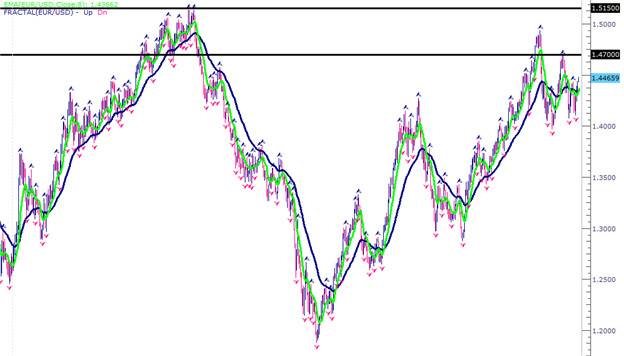 I’ll start to look for potential shorts, but I will not enter short until price action dictates as such. Intermediate-term resistance: 1.5150, at this level euro is making a new intermediate term high, and I may be slightly more tepid about opening short if E/U makes it up to this level, but once again – as price action and momentum head to the downside on the pair (indicating that the US Dollar is strengthening up as a ‘safe-haven play,’ while at the same time, the euro is weakening) then I will look to initiate my short positions. I am not sure where you’re getting your info, but good topic. I needs to spend some time learning much more or understanding more. 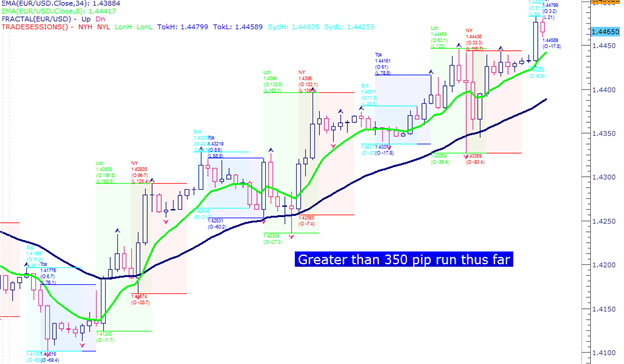 Thanks for excellent information I was looking for this Euro Breaking Higher, but Why? Manajemen Resiko for my mission.